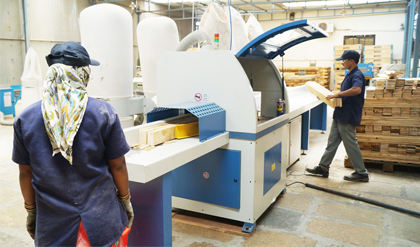 In our industry most of wood pallet are assembled manually, we have installed an automated pallet assembly line which gives us advantage by saving on labour, increase productivity for in time deliveries and standard quality. Our machine is computer-controlled, auto control and accurate positioning of nails, auto rotate pallet, auto stack, can greatly improve productivity and precision. 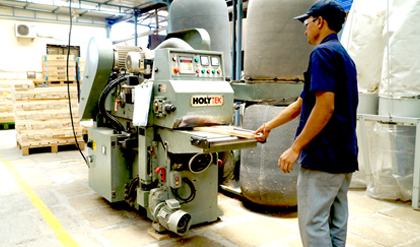 The automatic traveling cut-off saw is designed to cut pre-selected lengths of flexible or rigid foam from the slab produced at the end of a slab stock machine, utilizing a traveling head. 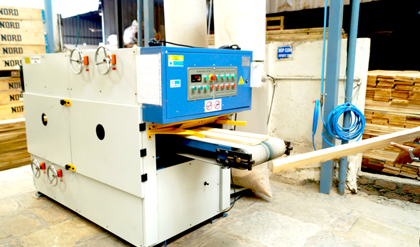 Automatic wood notching machine is specially used for wood pallet processing. 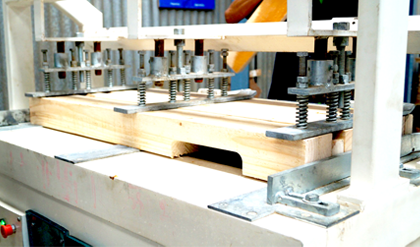 It can make different notching sizes and can be customised based upon customer requirements. Ideal choice of Imported Auto sanding machine for the highest levels of finish on the pallets.The innovative automatic machine offers maximum work precision and sensitivity. High speed automatic double side planing machine is provided with imported digital device, which can be operated directly to processing thickness from operating panel with higher accuracy .